The Java Arrays.copyOf Method is one of the Java Array Method which is used to copy the array content into new array of user specified length. In this article we will show you, How to copy Java Array to new array with example. Before we get into the example, the basic syntax of the Arrays.copyOf in Java Programming language is as shown below. If the user specified length is less than the Original Array, then remaining elements will be truncated. For example array a of integer type holds five elements (10, 15, 22, 45, 65, 3, 54) but we specified the new length as 4 (Arrays.copyOf(b, 4), then b array will become b holding elements 10, 15, 22, 45. The following Java arrays copyof method will accept the Boolean Array and Array length as the parameters and copies the Java Boolean array to new array of user specified length. Following Java arrays.copyof method will accept the Byte Array and Array length as the parameters and copies the Java Byte array to new byte array of user specified length. This Java array copyof method will accept the short Array and Array length as the parameters and copies the Java short array to new short array of user specified length. Following method will accept the Character Array and Array length as the parameters and copies the Java char array to new Character array of user specified length. Following method will accept the Integer Array and Array length as the parameters and copies the Java Integer array to new Integer array of user specified length. This Java array copyof method will accept the Long Array and Array length as the parameters and copies the Java Long array to new Long array of user specified length. Following method will accept the Double Array and Array length as the parameters and copies the Java Double array to new Double array of user specified length. Following method will accept the Float Array and Array length as the parameters and copies the Java Float array to new Float array of user specified length. This Java array copyof method accept the Object Array and Array length as the parameters and copies the Java Object array to new Object array of user specified length. Following method will accept the Object Array and Array length as the parameters and copies the Java Object array to new array of user specified length and Object type. Array: This is the Original Array. We are going to use the Arrays.copyOf method to copy this array to new array. 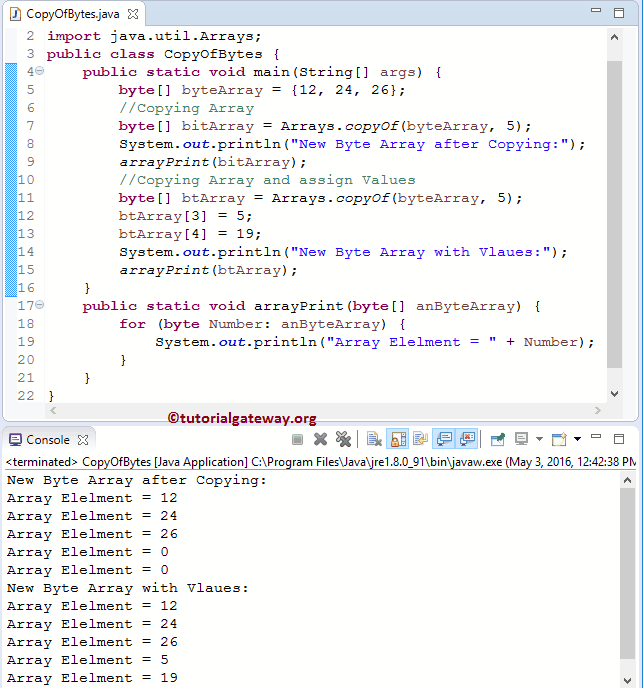 In this Java program we declared the byte array with random array elements, and then we will call the public static byte copyOf (byte anByteArray, int newLength) method to copy the Java Byte array to new array of specified length. In this Java program we declared the Boolean array with random array elements, and then we will call the public static Boolean copyOf (boolean anBooleanArray, int newLength) method to copy the Java Boolean array to new array of specified length. In this Java program we declared the short array with random array elements, and then we will call the public static Short copyOf (short anShortArray, int newLength) method to copy the Java short array to new array of specified length. In this Java program we declared the integer array with random array elements, and then we will call the public static Int copyOf (int anIntegerArray, int newLength) method to copy the Java Int array to new array of specified length. In this Java program we declared the long array with random array elements, and then we will call the public static Long copyOf (long anLongArray, int newLength) method to copy the Java Long array to new array of specified length. In this Java arrays copyof program we declared the double array with random array elements. Next, we call the public static Double copyOf (double anDoubleArray, int newLength) method to copy the Java double array to new array of specified length. In this Java program we declared the floating-point array with random array elements, and then we will call the public static float copyOf (float anFloatArray, int newLength) method to copy the Java float array to new array of specified length. In this Java array copyof program, we declared the character array with random array elements. Next, we call the public static Char copyof (char anCharacterArray, int newLength) method to copy Java Char array to new character array of specified length. In this Java array copyof program we declared the String array (string is an Object) with random array elements. Next, we will call the public static T copyOf (T anArray, int newLength) method to copy Java Object array to new array of specified length. In this Java program we declared the Object array with random array elements, and then we will call the public static <T, U> T copyOf (U anObjectArray, int newLength, , Class<? extends T> newType) method to copy Java Object array to new specified array.